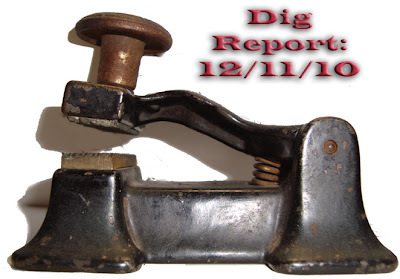 Urban Archeologist: Dig Report: 12/11/10 - I don't know...What the heck is it? It is a vintage Check Protector. In order to keep checks from being cashed more than once, many elaborate devices were invented to permanently mark, or in this case, mar the paper. A deft auditor or CPA could tell from the raised bumps this device would cause, that the check had already been cashed. There is a great site called the Early Office Museum that has many models in their archives, though this one is not one of them, it led me to identifying its purpose. As for its true age ...that remains a mystery. I continue to search through Google's scanned ads from the late 19th century hoping for a match. As for its true value...like all the items on my blog, none are for sale..today anyway. But I did find one on Ebay...of course. So, the sellers can breath a sigh of relief, they didn't sell the Arc of the Covenant, or an original copy of the Declaration of Independence, but maybe that $24 check used to purchase Manhattan was protected with....? It looks like it might have been an embosser of some sort... like a notary 'stamp'. Ah, I was thinking it was some kind of embossing press. But I can't really see what the plates do? Why don't you compress a sheet of paper in it and show us the result? By the way, thanks for the Wonderama clip. I used to dream about getting to be one of the kids on the show. Often, and in color. I was also picked as a volunteer and usually won some cool prize. Wonder(ama) what (de heck) happened to Bob? The lever might not be as old as you think. I remember using one when I worked for a bank back in the 1960's. I agree, though I think it speaks well of the stamp's quality, and recalls a time when everything about banking at least seemed more "solid." Thanks for commenting!